The Toronto Entertainment District is an area in Downtown Toronto, Ontario, Canada. It is concentrated around King Street West between University Avenue and Spadina Avenue. It is home to theatres and performing arts centres, three of Toronto's major-league sports teams, and an array of cultural and family attractions. The area is also home to most of the nightclubs in Toronto. The officially designated district does not include Yonge Street, where the Elgin and Winter Garden Theatres, Ed Mirvish Theatre, CAA Theatre, and Massey Hall are located, nor does it include the St. Lawrence Centre for the Arts or the Sony Centre for the Performing Arts. In the first half of the 20th century the original name of the neighbourhood was the Garment District and it was almost wholly industrial. The railways controlled a huge amount of land along the Lake Ontario waterfront, and to the north many firms took advantage of the easy access to rail and the harbour. The most important industry was textiles and fashion, and the area had few residents. The Royal Alexandra Theatre (left) during the Toronto International Film Festival. Opened in 1907, the theatre is the oldest continuously operating theatre in North America. However, the area was home to the Royal Alexandra Theatre. Opened in 1907, the Beaux-Arts styled proscenium-stage theatre is the oldest continuously operating legitimate theatre in North America. The theatre was later purchased by the Mirvish family in 1962. Manufacturing industry began to vacate the area in the 1970s, leaving behind an array of historic warehouses and factories that began to be converted to other uses. Meanwhile from 1976, the newly-opened CN Tower brought many tourists to the neighbourhood. Still, the most notable arrival were nightclubs that began opening sporadically in the early 1980s before becoming the area's staple and most recognizable feature from early 1990s onward. In January 1980, the Trinidad-born and Brooklyn-raised Assoon brothers (David, Albert, Tony and Michael) together with Luis Collaco and Bromely Vassell opened The Twilight Zone, Toronto's first large dance nightclub, at 185 Richmond Street West between Simcoe and Duncan Streets. Modeled after New York City's famous Paradise Garage club, the Twilight Zone quickly became popular with the Toronto youth, showcasing an adventurous mix of musical styles including underground disco, house, hip-hop, and techno thus giving the city its first taste of the kind of underground clubbing experience that had already been popular in New York City for years. Though located in a raw, gritty, and frugal space of a mostly unfurnished former industrial warehouse, the Twilight Zone still featured an extravagantly designed US$100,000 state-of-the-art sound system courtesy of New York City sound engineer Richard Long. Paid for with a sizable bank loan the Assoons took out by putting their father's house as collateral, its thumping bass could be heard miles away, flooding the deserted neighborhood with noise. Operating without a liquor licence, thus not serving any alcohol throughout its run, the club initially made a name via its Saturday night parties that went until the Sunday morning dawn featuring owners Tony and Albert Assoon spinning underground disco, funk, and freestyle tunes. Furthermore on Saturday nights, they introduced a practice of bringing international DJs, mostly from New York City and Chicago, such as David Morales, Johnny Dynell, Frankie Knuckles, David DePino, and Kenny Carpenter. Many of these early bookings were done through Judy Weinstein, New York based businesswoman and Morales' manager, who ran her own record pool that the Assoons were able to access for DJ bookings as well as vinyl material. In addition to attracting diverse general crowds, the club also became frequented by touring performers showing up unannounced just to hang out and party such as Detroit DJs Derrick May and Alton Miller who got brought into the DJ booth for impromptu performances. Performers booked on Saturdays went beyond DJs so that acts like LL Cool J, Sly Fox, The S.O.S. Band, D Train, Divine, Eartha Kitt, Spoons, Jermaine Stewart, and Anne Clark also played the club. Roy Thomson Hall is home to the Toronto Symphony Orchestra. The concert hall was opened in 1982. In 1982 Roy Thomson Hall opened at King and Simcoe, becoming the new home of the Toronto Symphony Orchestra thus expanding entertainment options in the neighbourhood beyond partying at the Twilight Zone. With the arrival of early house music out of Chicago in 1984, the Twilight Zone was among the first venues anywhere, alongside clubs in Chicago and New York City, to embrace the new sound, playing it heavily throughout its Saturdays club nights — the very first club in Toronto to do so. The Assoon brothers' business relationship with Weinstein and her 'For the Record' music pool benefited the club in this regard, enabling it to obtain and play new tracks and records long before they were available to the general public. Within two years, following the increased availability of house records in stores, the genre spread to other Toronto clubs such as the Copa in the Yorkville neighbourhood and the Diamond on Sherbourne Street that dedicated specific club nights to house. Into the mid 1980s, as the popularity of the Twilight Zone grew continuously, its offering expanded to other nights of the week. First to Fridays featuring Don Cochrane, a DJ from Scotland, playing new wave as part of a UK dance party theme and then Wednesdays, promoted as 'Pariah Wednesdays', featuring local DJs Siobhan O'Flynn and Stephen Scott who played a blend of alternative rock, UK pop, disco, and psychedelia. In May 1985, the Beastie Boys, in town as the opening act on Madonna's The Virgin Tour, were booked for an after show party at the Zone courtesy of Jonathan Gross, a writer for Rolling Stone and music critic for the Toronto Sun, who also handled some of the booking for the club. According to Gross, they got paid $1,500 and a case of Molson's for the club gig. Their chaotic appearance became part of the Twilight Zone's lore as the trio began essentially vandalizing the club's interior by spray painting its walls, however, instead of stopping them, owner Michael Assoon urged them to resume and their graffiti was kept as a badge of honour of sorts for the remainder of the club's run. Furthermore, the day before their scheduled paid appearance, they also showed up at the club during its Pariah Wednesdays night, reportedly visibly intoxicated, and tried to gain access to the DJ booth Resident DJ Siobhan O'Flynn politely declined. It wasn't until late 1987 that the still mostly deserted area got another nightclub — Stilife was opened by 25-year-old Charles Khabouth at the corner of Richmond West and Duncan. Its young owner quickly managed to monetize it by attracting affluent Toronto crowds, a business success that would in a few years bring many new nightclubs to the area. The railway lands to the south were also converted to other uses. The SkyDome sports arena opened in 1989, bringing thousands of fans of the Toronto Blue Jays and the Toronto Argonauts as well as fans of big musical acts to the area. LimeLight, a stylish club opened in 1993 by businessman Zisi Konstantinou at 250 Adelaide Street West near the corner with Duncan Street. This trend continued at such a rate that the area by mid-1990s became home to one of the largest concentrations of nightclubs in North America. Along with the nightclubs many bars and restaurants opened to serve these crowds. The Princess of Wales Theatre was built in 1993 by Mirvish Productions. Given the success of the Royal Alexandra Theatre, in 1993 the Mirvish family built the new 2,000-seat Princess of Wales Theatre a block over. Alternative theatres were also already in existence in this area with Theatre Passe Muraille owning a former warehouse and the Factory Theatre in a former manse. Toronto has emerged as the world's third-largest centre for English-language theatre, behind only London (West End theatre) and New York (Broadway theatre)." 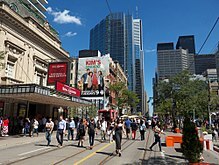 Canada's Walk of Fame got established in 1998, right in front of the two Mirvish-owned theaters on King St. West between Simcoe and John streets, acknowledging the achievements of successful Canadians. In 1999, Festival Hall opened at the southwest corner of Richmond West & John, containing the flagship Paramount Theatre Toronto that has since been re-branded as Scotiabank Theatre Toronto. In 2001, twenty-one-year-old local hospitality entrepreneur and former minor league hockey player Travis Agresti opened Inside at 218 Richmond Street West, a three-level nightclub that would become notable due to its association with the Raptors' basketball superstar Vince Carter who within two years decided to invest in the huge venue, becoming its co-owner. The two had reportedly met during late 1990s at nearby Fluid nightclub where Agresti worked as venue manager before deciding to launch his own nightclub down the street. Carter reportedly came to Inside's opening night and liking what he saw eventually decided to invest in the club. Though not involved in day-to-day running of the venue, Carter's high media profile nevertheless attracted a long list of visiting athletes, musicians, and entertainers to Inside such as Jason Kidd, Antawn Jamison, Barry Bonds, Prince, Nelly Furtado, NSYNC, Kanye West, Paris Hilton, Chris Rock, Jessica Alba, Elisha Cuthbert, etc. Even with Carter getting traded from the Raptors in late 2004, the club continued to thrive as a partnership between him and Agresti, expanding and opening additional lounges within the complex. However, the operation soured in the late 2000s due to the financial crisis and suddenly folded. By 2010, the space got turned into day care for the kids of employees working in the nearby Financial District. Simultaneously, all throughout the early 2000s, the Toronto condo boom began to transform the area. The abandoned warehouses began to be transformed into lofts, or demolished to make way for condominium towers. The core of the Entertainment District had only 750 residents in 1996, but this had gone up to 7,500 by 2005. The crowds, noise, and occasional crime especially associated with the clubs caused conflict with the new homeowners. Festival Tower is a cultural centre, condominium, and headquarters for the Toronto International Film Festival. The building was one of several condos built in the area during Toronto's 2000s condo boom. The trend of the area being turned into a residential neighbourhood continued even more rapidly in the second half of the decade. Nightclubs still opened, including CiRCA launching in October 2007 on John St. between Richmond West and Adelaide West inside the RioCan Hall (formerly Festival Hall), perhaps the most ambitious club ever in Toronto due to its sheer size of 53,000 square feet and the money spent before opening. Further adding to its mystique was the fact that the man behind it was Peter Gatien, legendary former New York City nightclub czar who owned 1980s and 1990s hotspots such as The Limelight and Tunnel before being deported back to Canada. However, CiRCA's financial implosion less than 3 years later only served to underscore the neighbourhood's shift and was seen by many as the definitive symbol of the death of Toronto's clubland. Greater restrictions on venues in the area resulted in loss of jobs; by 2011, the number of clubs had decreased substantially, from 60-100 in the period between 2000 and 2006 to 30 in 2013. On May 10, 2016, Toronto City Council voted unanimously in favour of naming a public laneway in honour of the Twilight Zone nightclub, after a successful online petition. This neighbourhood is rapidly changing with new Hotels and new condo developments. Bisha Hotel and Residences opened its doors in October 2017. Robert De Niro Nobu Hotel's Residences, an international luxury Hotel chain, started sales of their first Nobu Condos in Toronto in the summer of 2017 which was extremely well received. Penthouse units are now available for sale at Nobu Condos. It is located at 15-35 Mercer St, Toronto and will be built by Madison Homes. Nobu Condos is expected to be completed by July 2022. The Great Gulf Homes will be developing 357 King West Condos in the Entertainment District of Toronto at 357 King Street West, Toronto. It will be a 42 storeys building that will have a mix of 1 bedroom, 1+Den, 2 bedrooms and 3 bedrooms units. This condo project will resume sales in January 2018 and is expected to be completed by the summer 2022. Plazacorp's Theatre District development at 8-20 Widmer St. is scheduled for completion in late 2021. Empire Developments will develop Empire Maverick Condos, a 49 Storeys new condominiums at 323 King St West, Toronto. Sales will resume in April 2018 with estimated completion in the fall 2022. Pemberton Group will develop 543 Richmond at 543 Richmond Street West on the corner of Portland. While details of the scope of the project have not yet been revealed, an early drawing from the city shows that the multi-phase project will have 476 units and 15 storeys per phase. A podium terrace will hold outdoor amenities which are yet to be determined. Toronto architecture firm Quadrangle will be responsible for the build. ^ "OUR THEATRES - Royal Alexandra". Archived from the original on 2007-05-27. Retrieved 2007-07-11. ^ a b c d e f g Benson, Denise (5 October 2011). "Then & Now: Twilight Zone". The Grid. ThenAndNowToronto.com. Retrieved 27 October 2015. ^ a b c d e Boles, Benjamin (30 May 2016). "An Oral History of the Legendary 80s Club That Introduced Toronto to House Music". Vice.com. Retrieved 21 February 2017. ^ a b c d e f g h Hogan, Colm (6 September 2015). "PHANTOM ON THE DANCE FLOOR: A BRIEF HISTORY ON TORONTO'S TWILIGHT ZONE CLUB & HOW IT TRANSFORMED A CITY FOREVER". DigitizedGraffiti.com. Retrieved 21 February 2017. ^ a b Benson, Denise (17 November 2014). "Then & Now: Stilife". ThenAndNowToronto.com. Retrieved 10 November 2015. ^ David Gardner, "Theatre, English-Language — Current Trends" in The Canadian Encyclopedia, 2009, retrieved 6 July 2009. ^ Talotta, Vince (19 August 2004). "He's the owner of Inside, a club he started with Vince Carter. Story is a profile about how a 23-year-old got into the nightclub scene". Getty Images. Retrieved 16 January 2016. ^ Koreen, Mike (3 November 2004). "When life presents an opportunity ..." Toronto Sun. Retrieved 16 January 2016. ^ Corr, Aileen (2003). "In the clubs with Vince Carter". Sports Xtra. Retrieved 16 January 2016. ^ Trapunski, Richard (20 November 2014). "VIDEOBURN: Exploring Vince Carter's connection to music and Toronto". ChartAttack. Retrieved 16 January 2016. ^ Fong, Jennifer (4 March 2006). "New Celebrity Hotspot Kai Opens At Vince Carter's Inside". ANDPOP. Retrieved 16 January 2016. ^ Champion, Luke (29 August 2010). "How Inside Nightclub became a daycare". blogTO. Retrieved 22 January 2017. ^ Ladurantaye, Steve (26 November 2010). "The downfall of Circa night club". The Globe and Mail. Retrieved 18 December 2015. ^ Vincent, Donovan (1 December 2009). "Last dance for big-box nightclub?". Toronto Star. Retrieved 18 December 2015. ^ Doolittle, Robyn (30 May 2011). "Death of clubland". Toronto Star. Retrieved 18 December 2015. ^ Darchen, Sébastien (2013). "The Creative City and the Redevelopment of the Toronto Entertainment District: A BIA-Led Regeneration Process". International Planning Studies. 18, iss.2. ^ "The Twilight Zone gets a laneway named after it". NOW Magazine. 2016-05-16. Retrieved 2017-03-03.